I’m absolutely thrilled to have my first gardening article published today in Scottish Gardener magazine. It is distributed free with the Herald, and you can also subscribe to the quarterly magazine online here for just £6 for four issues. You can also get a digital version of the magazine via that link. Hopefully there will be more to follow – watch this space for further updates! That is a thrill. Congratulations. 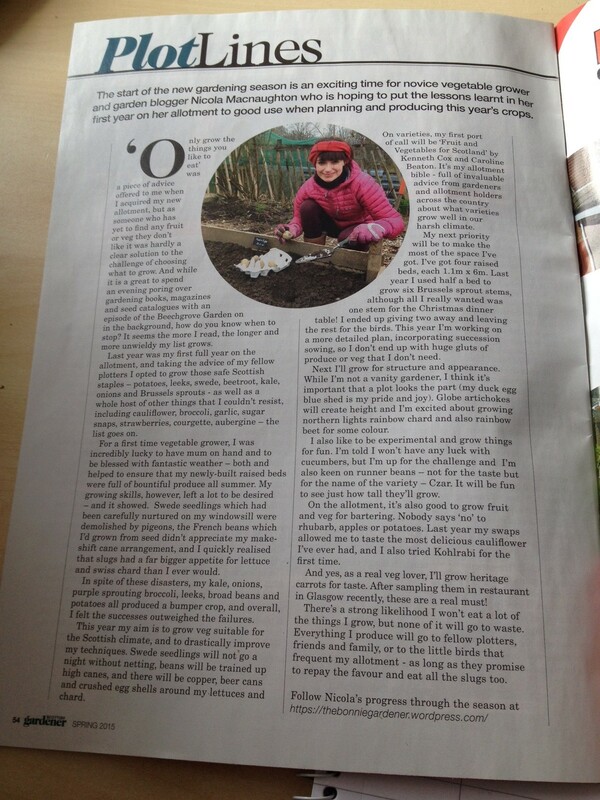 I was delighted to read your article as I went through a very similar experience last year in my first year of gardening and chose practically all the same vegetables as you did! I look forward to reading your next instalment to compare notes again. Thank you so so much Camille! My kids were totally making fun of the eyeshadow. Gotta love opeoinnatid teenage girls. Can't wait to see you soon.